18 ¼ x 23 in. In 1884, Camille Pissarro and his family left Paris for the small hamlet of Éragny-sur-Epte. 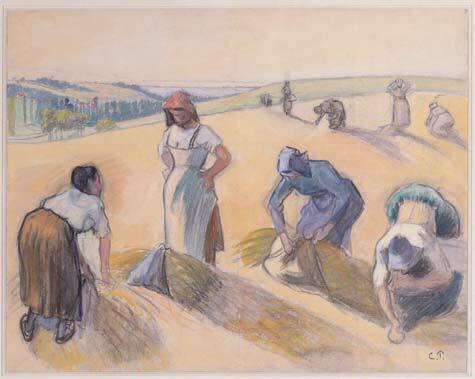 In Les Glaneuses, he recorded women in the field capturing meager remains after the harvest. This laborious work was done by the rural poor, who were allowed to keep whatever grain they could salvage. Beginning in the 1870s, Pissarro embarked on a series of images that celebrated this menial task, and he depicted the workers with dignity. This gouache, a heavy, opaque watercolor, is a preparatory work for an oil painting of the same name in the collection of the Kunstmuseum in Basel, Switzerland.